Stellar Robotics stands with the State Championship banner and trophy. 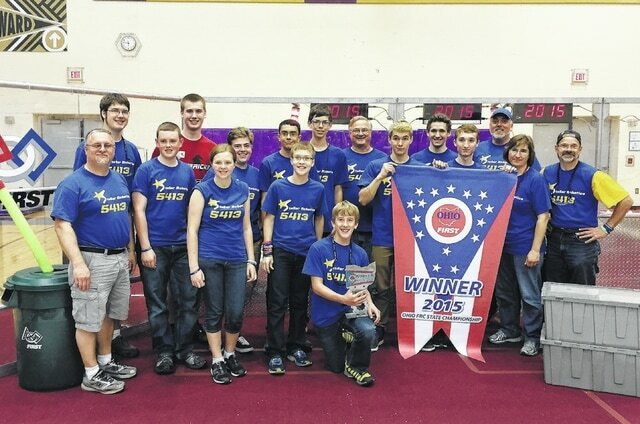 SHELBY — FIRST Robotics Competition Team 5413, Stellar Robotics, now owns the title of State Champions. On May 30 at Thurgood Marshall High School in Dayton, the state’s top 24 teams competed for the honor, but it was Stellar and their two alliance partners who brought home the gold. Stellar has continued to improve performance by improving their machine. Since the World Championship event in April, they have added a mechanism that helps to align the game pieces for easier and quicker acquisition. The team has room for more high school students to get in on the action. While building a robot might sound intimidating, participating on a FIRST team is anything but. The original 13 students came from communities across the area, including Mansfield, Crestline, Bellville and Lexington. They knew nothing about the program at first, but with the help of their mentors have begun to learn machining, wiring, programming, design, CAD—and that’s just the technical stuff. Opportunities abound for other interests such as artistry and public relations. “By the time a FIRST student graduates high school, they have the ability to be a skilled intern or employee at a local industry,” says DeYoe. “That makes FIRST Robotics a valuable addition to this area.” FIRST participants also receive more than $22 million in college scholarships each year. Over the summer the team will be touring some of their sponsor’s industrial facilities, sharing robotics with children through the library’s summer reading program and competing in the nation’s most prestigious off-season event, the Indiana Robotics Invitational. Stellar is the only rookie team to have been invited this year. You’ll be able to watch the livestream on July 17 and 18 via the team website, www.firstroboticsmansfield.com.